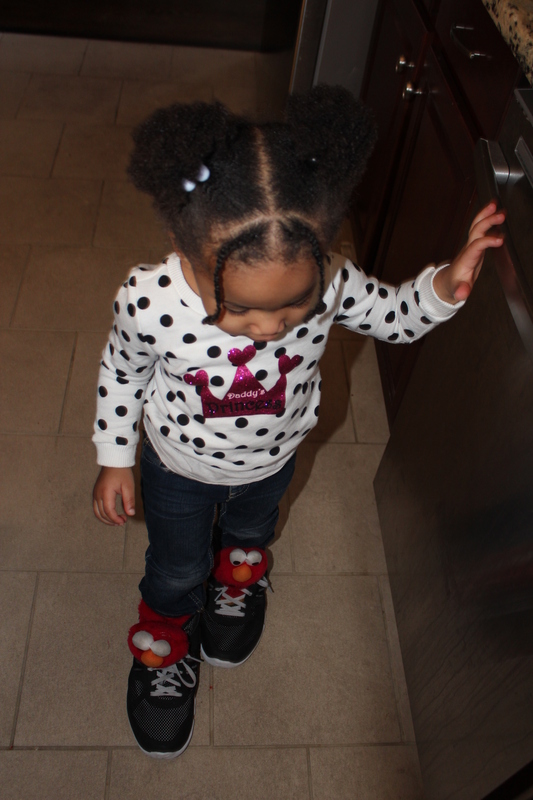 My little girl loves putting on my shoes or her daddy’s shoes and parading around the house. The smile on her face suggests that she feels like a big girl and enjoys the idea of trying to fit into our shoes. If only I could put on her shoes from time to time: not literally but figuratively. I want to know the thought process of my 22 month old as she continues to develop new synapses and becomes her own person. Quinn’s occasional frustration when she struggles to put on my shoes actually mirrors how I feel as I wish there was a way for me to put myself in her shoes and recall what I experienced when I was her age so that I can be more sensitive and patient as she experiences a vast array of emotions throughout the course of the day ranging from inquisitiveness, excitement, being distraught, playfulness, frustration, etc. I cannot even begin to imagine what is going through her mind as she goes through all of these new experiences while trying to figure out her surroundings and learn so much about them, not to mention her interactions with new people. I can barely fit my big toe into her shoe to get a glimpse into what she is experiencing, but she’s smart enough to put my shoes on with her slippers to ensure that the fit is snug enough so that they will not slip off. Though we all have our own shoes to fill, I am in awe that at one point I was where Quinn is now, and one day she will be where I am. A Chip Out the Big Bowl: Toddlers, Parties and Healthy Foods Don’t Mix! 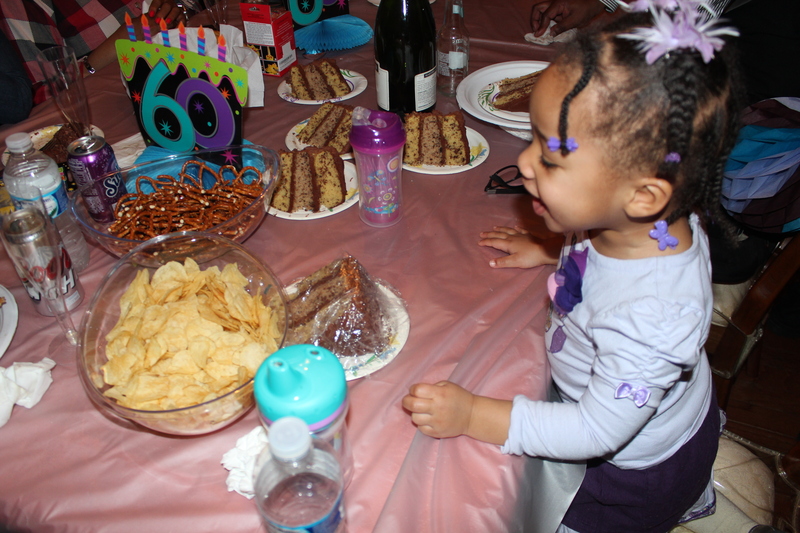 Getting a toddler to eat healthy foods is so tricky, especially when attending a party. Yesterday, my family attended my aunt’s 60th birthday celebration dinner, and my daughter could not resist reaching for a cupcake and then reaching for the bowl of chips, pretzels or any other goodies on the table. What’s interesting is that she has only had cake three times in her 22 months of life, once for her birthday, once at a birthday party and then for my birthday. Also, she’s only had veggie chips but somehow knew that she’d like the less healthier Herr’s original option. How is it that children naturally have not just a sweet tooth but a hankering for junk food? Yes, I’m one of those, “It’s got to be healthy; are there any nutrients!” or “It’s got to be organic” moms, and it is getting tougher and tougher to keep Quinn on board. My family thought it was absolutely hilarious when Quinn just kept sneakily coming back to the table to grab chips and pretzels or even reach for another cupcake. This was one battle I just was not going to win. I’m just hoping she’ll still be willing to eat her veggie chips now that she’s gotten a taste of what she probably considers to be the good stuff! PS. My sister suggested that I write about this incident on my blog as she, my cousins, aunts and uncles laughed as Quinn went back for chip after chip, so here it is! My Little Girl Can Count! With just a little under two more months to go before my little girl is two, she’s been showing more and more of an interest in numbers. A few months ago, I was blown away with Quinn’s ability to recognize numbers one through ten. Lately, she has been not just reciting her numbers but using her fingers which is an indication that she is already beginning to grasp the concept of counting. Since Quinn is being educated at home, I’ve been using countless resources to help with her intellectual development. Out of the many resources, one that my daughter really loves is the items in a can that I purchased from Amazon: Learning Resources One to Ten Counting Cans. At the start of each week, she knows we will be opening up a new can and will jump up and down with excitement as I grab it from the shelf. Before she opens the can, she’ll look at the number on the can and shout it out. Then she can barely contain herself as she pops open the lid and empties out the contents. Usually, she will observe me as I count and will repeat after me, but a few days ago she starting counting the pineapples, which look so realistic, all by herself (Of course when I began to film her, she got camera shy). I highly recommend this resource not just for parents of stay-at-home children but for any parent looking for a fun and engaging way to help their toddler learn numbers and how to count. In life, everything is not black and white; there are different shades of gray. Who hasn’t heard that cliche statement or some variation of it? 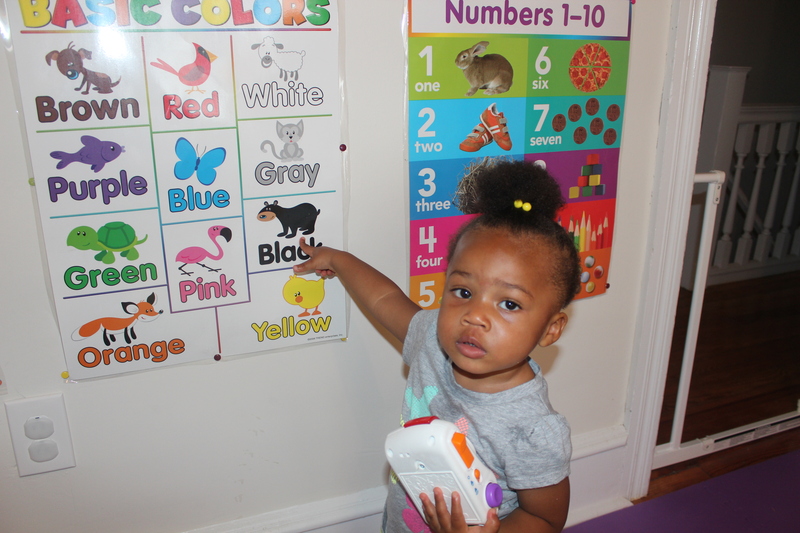 Even a toddler who is eager to learn and explore her surroundings quickly becomes aware of what this means, even is she cannot articulate it, when familiarizing herself with the concept of colors. My little girl, who will be 22 months in two days, does not go day care but has daily number, alphabet, color and critical thinking lessons taught by her father or me, which she enjoys. 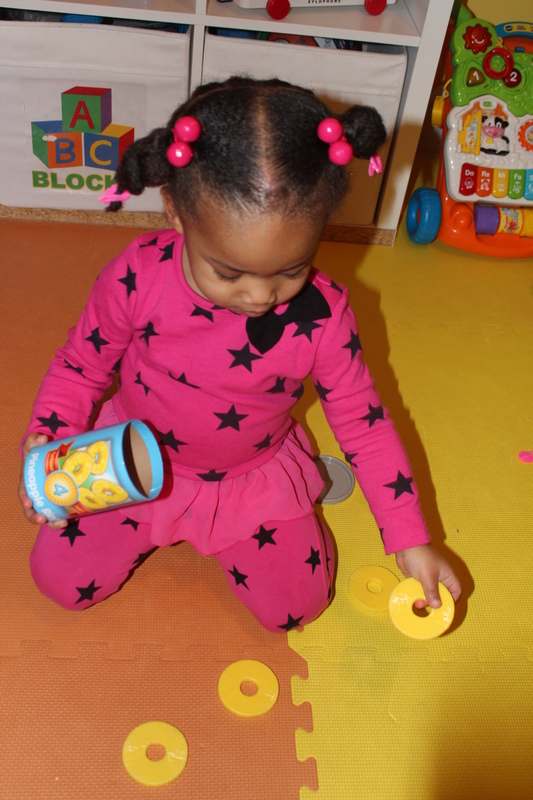 While learning her numbers and even counting to ten and knowing all of her letters and some shapes too are some skills she mastered months ago, the colors, those countless shades of colors, are taking a bit longer. Initially, I was concerned that she only recognized about four colors consistently, the primary colors (red, yellow and blue) and purple (we’ve been working a lot with purple). Then it occurred to me (and after doing a little research) that most children do not master the basic colors until around age three. Also, the intricacies involving the many shades of colors can be quite overwhelming. While I try to use items that are “true or basic colors,” we come across so many different shades of the same color in our day to day activities that make learning colors one convoluted task. Why must there be so many shades of the same color? Yes, this comes in handy when picking that “perfect” shade of paint for a living space. But try explaining to a toddler that blue is not just blue. There is light blue, sky blue, royal blue, navy blue, etc. What about those colors that are a cross between two? My daughter has a bath time toy that is a fuchsia shade, which is a cross between purple and pink. How can a toddler, let alone an adult, grasp the concept of colors when there are so many different shades and mixtures? Presently, we do a color of the week. Quinn and I will wear the color throughout the course of the week. We will have a treasure hunt and find objects around the house in that particular color and sing silly songs about the color. Some of the activities will involve making and playing with play dough in the color of the week and coloring pictures with the color of the week. 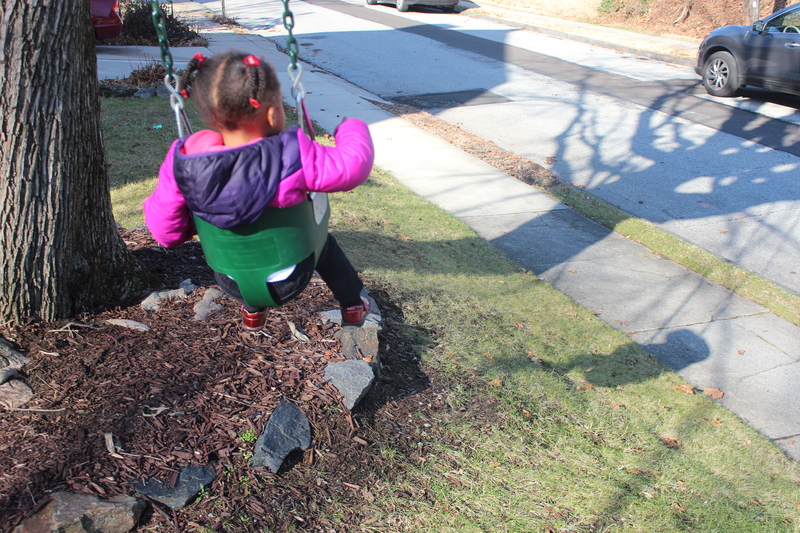 While I drive my self nuts trying to make this learning process fun and less confusing for my daughter, I find that I just might be making it more overwhelming than it needs to be for me. Then I must remind myself that a benefit my daughter has is that her brain is absorbing far more and building many more new connections than my adult brain is today. She’ll master those many shades of colors in no time! 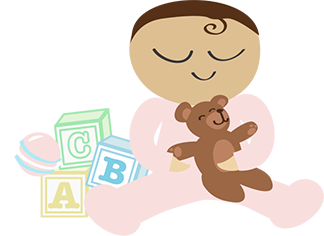 If you have any suggestions or activities that have helped your child learn colors, please feel free to share.